I’m a fiction writer, Rose Jenster, and love to write books about women seeking happiness in love by leaving their difficult circumstances. My books are focusing now on the 19th century and the trials of women on the east coast who adventure out west to Montana. This took tremendous courage and often created a rift with one’s parents and family. Not only is a young woman dealing with fears of being alone her whole life and the apprehensions of going west, but also there can often be rejection from one’s family for taking this kind of leap. This will be four or five stand-alone books, but also with some connections between characters as the series develops. Each book however can be read without reading the other ones. 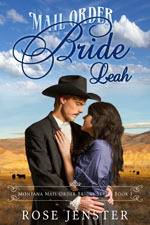 In the first book of the series, “Mail Order Bride Leah” (click here) , we meet Leah who is a school teacher in Albany. She is saddened by the death of her mother and the decline mentally of her father (which resulted in his business failing). Leah does not want to live at her brother’s family’s home and be a burden. Her brother’s wife, Jane, told Leah that her sister found happiness by answering a mail order bride ad. We watch Leah’s journey in reading and answering ads and developing feelings for a man she corresponds with from Montana. Leah did not expect her brother’s disapproval about meeting the man she developed strong feelings for and we get to experience her dealing with his rejection, adventure out west and the physical and emotional trials that she goes through in sorting out this new experience. Why does the man that she felt so close with by mail change in person? What creates his distance and can this gap be bridged? Who is the person from the past that haunts him? Read more about Leah’s trip out west and how it turns out for her HERE. If you’ve already read about Leah’s story, Book 2 is also available. 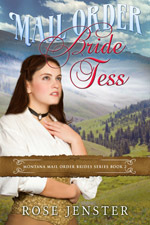 It is here, “Mail Order Bride Tess“. I’ll describe it more in the next post. The second book involves another woman from Albany, NY and her journey to find love and happiness. If you want to join the mailing list to get updates on new releases, free stories and extra tidbits, just sign up below. I’ll let you know as soon as Felicity is out! .in Leah is called Helen Kathleen but in Teas she is called Pearl.. is there a reason for the difference? Roxann, Thank you for reading and enjoying the books and I might have not written this in but Leah loved the Henry gave her that beautiful ring with the 3 pearls. It was a slim silver circlet with 3 pearls set in the band. Pearl became a little nickname they used! I am sorry if I did not mention that! Thank you for your attention to detail and for reading the series. In book 4 the Albany girls will be meeting so that will be interesting! Leah and Tess were females I truly admire. It is nice to see spiritual, strong and intelligent women are also value family life and traditional values. I can’t wait to read Felicity’s story as well. I’m recommending this to people at church, We need more clean stories in our world today. I have enjoyed both Tess and Leah and am dying to read Felicity. Can you tell me when you expect the book to be available? Thank you so much for your kind words. It should be out within 2 weeks. I am working on editing. I am glad you enjoyed Leah and Tess’s stories. I will post about it and also send out a newsletter right before it’s released! Have an awesome weekend. I read both the Leah story and Tess’s on Saturday and love the way you go into the inner thoughts of each of them. Thank you for staying clean as my girls that are 18 and 20 can read this! When will book 3 be out? Yes, I like to keep the books family-friendly and want also teens and college students to see the strength in women and that life doesn’t have to revolve around texting! I think Felicity will be out within 2 weeks! I am working hard to finish things up. I really loved the story about Leah and that she taught as well as read widely! I know how hard it is to deal with a family situation who doesn’t approve of your choices and I’m sure this was even harder in the 19th century. I plan on reading book 2, Mail Order Bride Tess over the weekend because it’s supposed to rain .